Inspired by Jane's hamster quilt ( that has to be the luckiest hamster in the world ). Measuring 18 x 26", and using whatever fabrics were closest, it only took a couple of hours to do. Just strips of fabric, hastily sewn together, and a bit of ribbon and lace here and there. But, it's ready to take to a baby who decided to arrive a couple of weeks early. Thank you for the inspiration Hugo. I think it's lovely, so pretty! It's precious. Thank goodness for Hugo. it's supercute, I love it! I hope the baby is good, it'll be very snug. What lovely colors.Love the little bits of lace added in. Hope baby is doing well. That is gorgeous, the baby will grow up to love it. ooooooooooooo I just love the yummy fabrics/colors in this! I will say it again - you make the BEST stuff!!!!!! Thomas and I love it, and Hugo reckons it should be for a girl hamster. My neice just arrived last night. THANK YOU!!!!! !..This would be perfect! so lovely and great !! Where do you find such nice fabrics ? they 're so cute ... i've never seen such in france ! great fabric combinations - it's gorgeous! Lyn its wonderful, very Oilily-esque. Are some of those Kaffe? If they are I've never loved them so much as in this quilt. How does one make a quick quilt?! You are a regular Houdini. Lovely! And lucky baby too! Love it! I have a fear of quilting, but I think if I tried something smaller like this I might get over it. I mean, it's so adorable! Very sweet! I love all the pink. It's lovely! What a lucky baby. It looks just lovely, so pretty. The baby will be glad she came early! Oh, it's so pretty! Love the fabrics you have close-by! That's a great, especially for how long it took you! I love the embellishments. the fabrics are just wonderful! and it looks perfect to me!! a very thoughtful gift. Your blog is amazingly beautiful !! I love this quilt and the hamster quilt. Now I want to make one!!! I love your works, you always use such bright and lovely colors! Beautiful. It's bee-you-ti-full!!! I'm impressed! Yes, I too want to sew just like you! The quilt is just beautiful!! The fabrics, the composition, the blonds, everything is just perfect! So cute! I love the fabrics and color combinations. Oh, I have to disagree, it *is* perfect. Just lovely. So cute! And I think it's perfect! And that hamster quilt is really something amazing! Puts my dog quilt to MAJOR shame (but I guess not really since the dog loves it)! You are so clever, that is just gorgeous - perfectly simply and lovely. Ahhh! 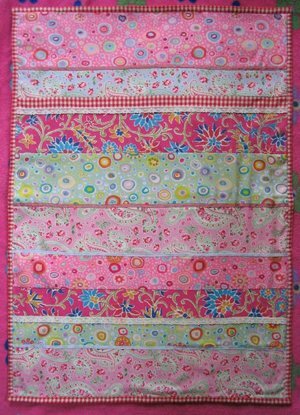 I am looking at this quilt again, and didn't notice the first time the little bits of ribbon and laces...so darling! What a great addition to the quilt...provides the babe with a bit more for the senses...charming.